Men's stud earrings describe earrings with no hanging parts. At Trendhim our earrings come in a wide assortment of materials and colours. All models are sold individually and are in stock. Our stud earrings are available in many different materials that each have their own advantages and disadvantages. We have briefly summarized these to help you with your selection. Remember that you can search for the materials you like using the menus at the top of the category. Acrylic glass is a hard clear plastic that is often better known by its brand name Plexiglas. This type of plastic is known for its flexibility as well as its strength. The main advantages of an acrylic stud earring are its lightweight and durability. Also known as 316L stainless steel, this material gives the earring a superb silver look that far outshines any acrylic. It is important to point out that surgical steel is a metal alloy made from a mixture of chromium, manganese, titanium, carbon, silicon, nitrogen and nickel. The exact combination of these metals varies from manufacturer to manufacturer, but one fact remains universal, all steel contains some nickel. Our steel earrings comply with the EU standard that specifies that they must secrete less than 0.5 micrograms of nickel per cm2 per week. People who are highly sensitive to nickel would be wise to consider another material for their earrings. Perfect for those who enjoy high quality silver products and who may be sensitive to nickel. Sterling silver is well known for its rich looks after all its make up is 92.5% pure silver with a mere 7.5% copper that is necessary to give sterling silver enough rigidity to make fine jewellery. So sterling silver is ideal for its lack of nickel content and simply pure beauty. 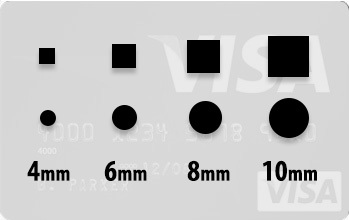 By their nature, stud earrings are usually smaller and one can see their dimensions against the backdrop of a credit card for reference. All of our stud earrings for men are tested nickel free, meaning they release less than 0.5 micrograms of nickel per cm2 per week. Wood and sterling silver are good alternatives to steel if you suffer allergic reactions to even the smallest amounts of nickel.